Dr. A.S. Ganesan is the Chancellor of Vinayaka Mission’s Research Foundation (Deemed to be University) and is instrumental in the growth of the institution from its humble beginning since 1981 to VMRF DU with over 15,000 students and more than 5000 employees today. 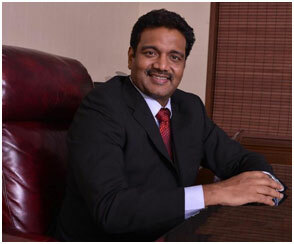 Dr. A.S. Ganesan completed his Medical Degree in 1992 from Madras Medical College and continued his higher education in medical and management at MMC, Chennai and Heidelberg University, Germany. Since 1995, Dr. A.S. Ganesan has associated himself with the Founder Chairman Dr. A. Shanmugasundaram in establishing and developing medical colleges in Pondichery & Karaikal and an Engineering College in Chennai. He took up end to end responsibility towards establishing and governing the institutions to offer multiple programs in UG and PG. Dr. A.S. Ganesan was instrumental in growing the campuses into Deemed to be University in 2001 through his administrative ability and vision to achieve the highest levels of distinction in the transmission of knowledge to inspire the youth. In the year 2013, Dr. A.S. Ganesan was appointed as the Chancellor by the Board of Trustees headed by the Founder Chancellor. He provides strategic guidance and leadership to the Vinayaka Mission’s Research Foundation (Deemed to be University) offering undergraduate and post graduate programmes in Medicine, Dentistry, Homeopathy, Pharmacy, Nursing, Paramedical, Engineering, Management and other disciplines. Under his leadership VMRF-DU contributes to the medical and healthcare needs of the society through its ambit institutions and network of hospitals. It provides sophisticated facilities and expertise and used as referral centers by the neighboring hospitals. VMRF-DU hospitals serve in alleviating the health care problems of the rural community. His vision and continuous focus is to uplift the economically weaker sections of the society living in rural areas through education, employment, health facilities, social and community development. He is a leader par excellence in higher education, well known for his commitment and advocacy for accessible high quality graduate and post graduate education for rural youth. Dr. A.S. Ganesan is keen in promoting innovation, multi-disciplinary research, introducing socially relevant programs, skill development, industry affiliations and international collaborations. He received “Edupreneurs Award for Education Excellence” by “Times of India” in 2012 and 2014. He is also the President for Aayira Vysiar community which consists of approximately 4 million people across the globe and he supports health care programs, educational scholarship, youth welfare, women empowerment, green initiatives and community transformation. Dr. A.S. Ganesan continues the philanthropic activities started by the Founder Chairman Dr. A. Shanmugasundaram including management of the magnificent “1008 Shivalaya Temples” in Salem which is also a part of the “Incredible India“ promoted by the Ministry of Tourism, Government of India and a landmark in the state of Tamil Nadu. Apart from this, several temples, community halls, buildings and lands have been donated for several charitable activities in Tamil Nadu and Puducherry. Dr. A.S. Ganesan is married to Dr. Anuradha and is blessed with a daughter and a son.